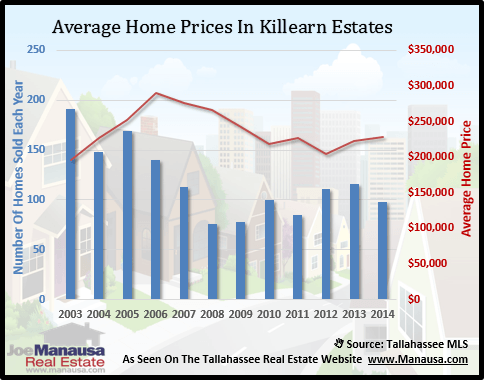 Killearn Estates Home Values have been on a steady decline since 2006, and there is nothing occurring in the local economy or housing market to indicate a change in this trend. Home sellers who listened to good advice got their home sold in the past few years, while those that did not remain on the market and hoping for values that will not come. Currently, there are 54 homes for sale in Killearn Estates in the Tallahassee MLS, with the lowest priced at $84,900 and the highest asking $470,000. Additionally, many more are waiting in the wings for news of a housing market recovery. We have mentioned on numerous occasions, for all Tallahassee neighborhoods, that our shadow inventory is filled with people who have recently failed in their efforts to sell a home. The average selling price of a home sold in Killearn Estates is just below $220,000. Many sellers who are advised of average price movement might believe that prices are the same as they were back in 2004, as we can observe from a graph of average home prices. When we look deeper than just the average home price report, we find darker news. Buyers are simply choosing to purchase the larger homes, sending a signal that low interest rates are allowing them to spend more, but they are still very choosy and value conscious when they buy. 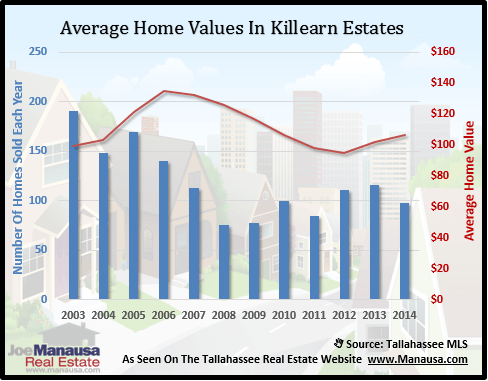 This next graph shows that home values in Killearn Estates have fallen off the ten year graph, meaning home values are lower today than they were ten years ago. The blue bars in the graph above shows that buyers are getting much more home for their money. The problem with looking at an average price report and trying to discern real estate appreciation in Killearn Estates is that you are not comparing apples to apples. This graph shows that the apples are getting bigger, but more money is not being spent. The average value of homes being sold in Killearn Estates continues to fall. If you are considering a home sale in Killearn Estates, please drop me a note and I will take the time to sit down with you to discuss the entire scope of your competition and what you need to do to get the top dollar for your home.